As you use your Frigidaire dishwasher, you can encounter problems with its performance. If it stops during the middle of a cycle, the problem may be one that you can fix on your own, with no dishwasher expertise required. In fact, it may save you the expense of a repair technician. Look at the dishwasher control panel to see if you have any lights on the display. If not, the dishwasher may lack power. You may have had a power surge that resulted in a blown fuse or tripped breaker. Older homes generally have a fuse box while newer homes have a breaker box. Check to see which you have. You must replacea blown fuse but just reset a tripped breaker. 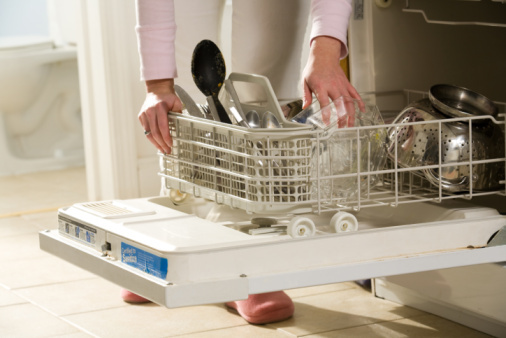 A water supply problem can cause the dishwasher to stop during a cycle and not finish. Try turning on a faucet in the home to determine if you have water. If not, contact your water supply provider to report the problem. The dishwasher has multiple cycle options and you may have inadvertently selected the wrong cycle, which makes it think it should stop early. For instance, the rinse-only cycle lasts just 17 minutes. The normal wash cycle is between 84 and 118 minutes. The dishwasher will not operate if the door is not completely closed. The door should lock when a cycle is running, but a faulty lock can cause it to not work properly. If you open the door during the cycle, or it opens because of a faulty lock, the cycle will stop. To restart the cycle, the door must be securely closed. If the lock is faulty, you should consult a qualified Frigidaire technician to get it serviced.